Do a trial run. If you don't plan on proposing for quite some time, present her with a lovely, but inexpensive fashion ring on her birthday or some romantic holiday. Giving her this ring can be "practice" for the real thing. And although you may not buy the right size initially, you will more than likely find out her correct finger size for her diamond engagement ring. Find an accomplice! Get her mom or one of her friends (who can keep a secret) to go shopping with her and get her to try on wedding diamond rings at any jewelry store. Everyone can get their fingers sized! They can excuse this as speculative fun, and your girlfriend may not suspect a thing. Go shopping with her. Is there anyone else you could potentially say you're picking out a ring for (a mother, grandmother, etc.)? That way, you could go ring shopping with her and get her to model different rings so you can see what they look like. You could discuss ring sizes, and then take this opportunity to get her finger sized at the store "just for kicks." You will also be able to get a good sense of the styles of engagement rings she prefers. Buy a fake ring...some $10 thing from a department store as a "surprise". Then tell her you want to go shopping together for engagement rings online at DanforthDiamond.com. This way, she can pick the ring of her dreams, and in the correct size. 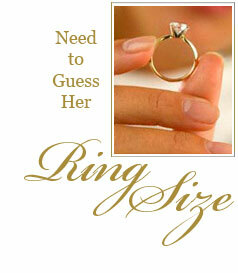 Just WHAT is the average size ring for a woman you ask? According to statistics, the average American woman is 5'4" tall and weighs 140 pounds. Using this statistic, you may be able to make a good guess on your girlfriend's finger size. Does she have a small, average or large frame? How much does she weigh? (Don't ask her weight if you don't know it...this could be dangerous if asked at the wrong time!). But do take notice of her frame, her weight and her hands. Also notice if she has large knuckles as well. Her fingers may be slender, but if her knuckles are large, she may need a larger diamond engagement ring to fit over the knuckle. More than likely, if she is small-framed with slender fingers and weighs under 120 pounds, her finger size could range from a 4 to a 5. If she is larger-framed with thicker fingers and weighs over 150, a good guess may be in the 7-9 range. For best fit, the engagement ring should be snug with a slight resistance when pulled off. Wider rings should be a little looser. You will have to use your own judgement when shopping wedding diamond rings, but using these guidelines could be helpful to you in making an educated guess.